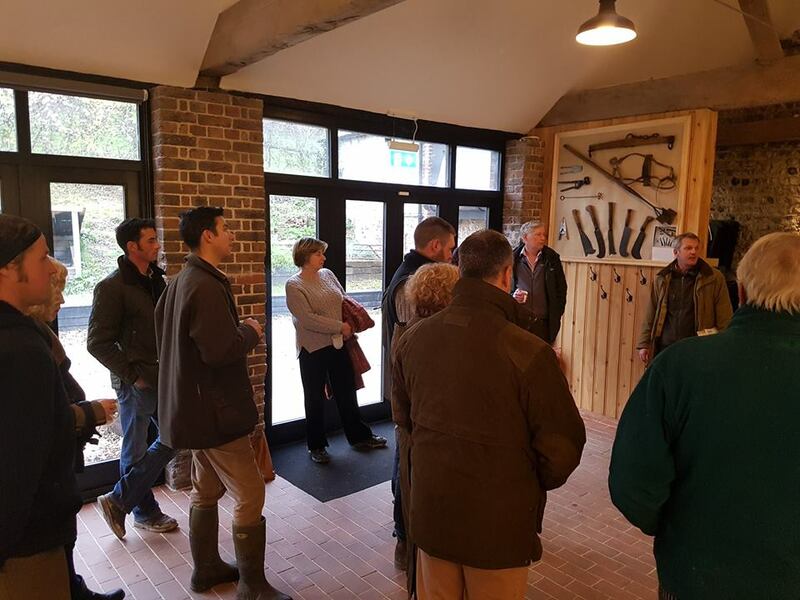 The group met at Saddlescombe Farm for a farm walk kindly hosted and lead by Camilla and Roly Puzey. 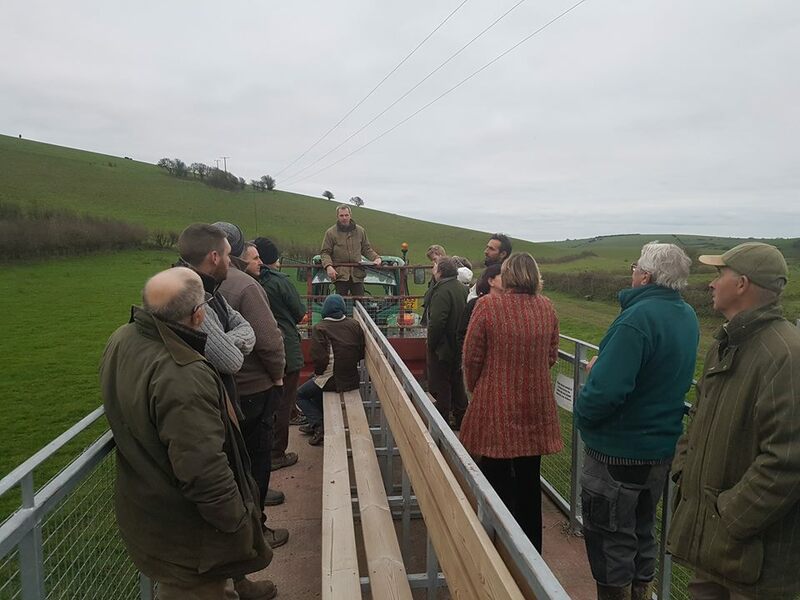 It was great to have a number of farmers and graziers along who farm in some of the most public and well visited parts of the South Downs National Park Authority (SDNPA). Starting off looking towards Devils Dyke the group discussed the importance of personalised signage regularly checked and moved with the livestock to let the public know where livestock are grazing. Ensuring there is no doubt that livestock are in a field, which can be tricky with large and undulating areas, means that no one (people, dogs or sheep) gets any unexpected surprises. Sarah from Hounds On The Downs talked about how it is important to her to be able to identify areas where livestock are not currently grazing so that she can let dogs run without any risk of encountering livestock. The group discussed the rights of dog walking businesses to use other people’s land to operate from, with James Osman from NFU Online and David Larkin from Brighton & Hove City Council contributing to the discussion. While anyone can pass and re pass along public rights of way with dogs under effective control, the rules for “Open Access” require dogs to be kept on a short lead between 1 March and 31 July to help protect ground nesting birds, and all year round near farm animals. Other members discussed how “dog proofing” gates can be useful so that if a dog is out of control in one field it can’t then get into another. The group then hopped on to a very smart trailer kitted out especially for farm tours to look at another area of the farm. Here farm visits, lambing experience days and social media were discussed. The farm is a very public “shop front” not only for Camilla and Roly’s own produce but also representing all British Farmers. One initiative is to bring chefs from Brighton onto the farm to experience lambing and see how the meat they buy is produced, this helps spread the message of the quality and importance of British Farming. There are many other groups that regularly come to the farm and these visitors form an important enterprise in the farm business. James Osman told the group about the work the NFU is doing locally and nationally including guidance on livestock and rights of way, working with local police, producing new signage, inputting to Public Spaces Protection Orders (requiring dogs on lead by direction) and many other areas of public engagement. A very important point James made was that where there are repeated problems it is critical to report them and obtain a crime number. This can be a time consuming process but https://www.witnessconfident.org/self-evident-app can help. All in all it was a very interesting afternoon. The ability to graze sensitive chalk grassland is a critical component managing the South Downs. Fortunately the vast majority of farmers are committed to Stewardship schemes which help to fund the management of this sensitive landscape. Farmers are increasingly looking at ways to work with our non-farming neighbours to do not only this, but also safeguard the production of our food. There are opportunities in the Countryside Stewardship Scheme https://www.gov.uk/…/countryside-stewardship-get-paid-for-e… to be paid for providing educational access.